Top, The continuity model of pathological gambling (PG) posits that subclinical manifestations of PG lie on the same liability dimension and share the same risk factors as the diagnosed PG disorder. Individuals whose liability exceeds the first threshold (T1) will manifest at least 1 PG symptom, and those whose liability exceeds the second threshold (T2) will manifest at least 4 PG problems and meet the diagnostic criteria for DSM-III-R PG. Bottom, The discontinuity model of PG posits that the liability for diagnosed PG disorder is different from the liability for subclinical manifestations of PG, or problem gambling. Individuals whose liability exceeds the threshold (T) on the subclinical PG dimension will manifest 1 to 3 PG symptoms, and those whose liability exceeds the threshold (T) on the PG disorder dimension will manifest at least 4 PG problems and meet the diagnostic criteria for DSM-III-R PG. Because the liability for diagnosed PG disorder and subclinical PG are distinct, an individual's position on one liability dimension is independent of his or her position on the other liability dimension. Percentages listed next to the distributions are the observed prevalences of each diagnostic category in the sample of adult male twins. Path diagram of the association between pathological gambling (PG) and alcohol dependence (AD) for a single individual. The variance in liability for PG and AD is decomposed into that caused by the effects of additive genetic influences (A), shared environmental (C) or nonadditive genetic (D) influences, and nonshared environmental influences, including measurement error (E). The correlation between PG and AD liability is similarly decomposed into that caused by additive genetic influences (rA), shared environmental (rC) or nonadditive genetic (rD) influences, and nonshared environmental influences (rE). Note that with data from monozygotic and dizygotic twins only, either C or D (but not both) can be estimated as a source of variation in liability for a trait within a given model. Background In comparison with alcohol dependence (AD), relatively little is known about the causes of pathological gambling (PG). Given the high rate of comorbidity between PG and AD, knowledge about the causes of AD may be applied to understanding those of PG. Methods Subjects were adult male twin pairs from the Vietnam Era Twin Registry. Lifetime histories of PG and AD were assessed by structured psychiatric telephone interview. The validity of a continuum of PG liability was tested to determine whether the causes of subclinical PG, or problem gambling, are quantitatively or qualitatively distinct from those of DSM-III-R PG disorder. Genetic model-fitting methods were used to quantify the extent to which the genetic and environmental risk for PG could be explained by the risk for AD. Results Tests of the continuity model of PG were all consistent with the hypothesis that subclinical PG and DSM-III-R PG disorder have many, perhaps all, of the same risk factors and thus differ quantitatively rather than qualitatively. Depending on the PG definition, between 12% and 20% of the genetic variation and between 3% and 8% of the nonshared environmental variation in the risk for PG were accounted for by the risk for AD. Conclusions Subclinical PG, or problem gambling, may be a milder form of PG, rather than an etiologically distinct syndrome. Risk for AD accounts for a significant but modest proportion of the genetic and environmental risk for subclinical PG and DSM-III-R PG disorder. IT HAS BEEN SUGGESTED that individuals with pathological gambling (PG) experience and become dependent on achieving an aroused, euphoric state similar to a drug-induced "high. "1-4 Thus, PG has been conceptualized as an addictive disorder, similar to alcohol and drug abuse.1,5-7 The conceptualization of PG as an addictive disorder is embodied in the DSM-III-R8 and DSM-IV9 PG criteria, which include the concepts of preoccupation, loss of control, tolerance, and withdrawal. 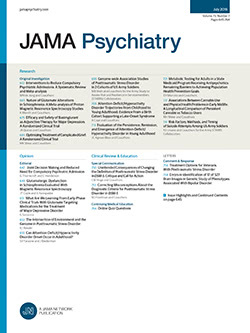 Perhaps the most well-established finding in the literature consistent with the conceptualization of PG as an addictive disorder is the high rates of alcohol dependence (AD) and other substance use disorders among individuals with PG.10-23 For example, 19% to 50% of individuals in treatment for PG10,19-21 and 45% to 63% of individuals with PG in the community11,22,23 have a history of alcohol abuse or dependence. These results suggest a common underlying vulnerability for PG and other addictive disorders such as alcoholism. A recent meta-analysis of 119 PG prevalence studies in the United States and Canada24 estimated the lifetime prevalence of diagnosable PG among adults at 1.6%. An additional 3.9% of adults have a history of problem gambling (ie, gambling that has an adverse impact on the individual but that does not meet the criteria for a diagnosis).24 It is important to know whether clinically significant PG and subclinical PG share many of the same risk factors and differ mainly in level of severity, or whether they have distinct causes and thus differ qualitatively from each other. Family study methods provide a powerful approach to testing questions of diagnostic continuities vs discontinuities by examining the risk of, for example, diagnosable PG and comorbid conditions such as AD among the relatives of individuals with diagnosable PG vs subclinical PG vs no PG symptoms. A continuity model predicts that relatives of individuals with subclinical PG would be at intermediate risk of PG (between relatives of individuals with diagnosable PG and those with no PG problems), whereas the discontinuity model predicts that relatives of individuals with subclinical PG are not at increased risk for diagnosable PG compared with relatives of individuals with no PG problems. In the present study, we examined in a large registry of adult male twin pairs (1) the evidence for the continuity model of PG and (2) the causes of comorbidity between PG and AD. In a previous study that used this sample, Eisen and colleagues25 found significant familial aggregation of PG. Monozygotic (MZ) and dizygotic (DZ) cotwins of individuals with a history of DSM-III-R PG had lifetime rates of PG of 22.6% and 9.8%, respectively. In the present study, we explored the familial coaggregation of PG and AD by examining the extent to which rates of AD were elevated among the MZ and DZ cotwins of individuals with a history of PG. Furthermore, by comparing the patterns of coaggregation between PG and AD in MZ vs DZ twin pairs, we examined the extent to which PG shares a common genetic and environmental vulnerability with AD. Participants were members of the Vietnam Era Twin Registry, a national sample of male-male twin pairs born between 1939 and 1957 in which both twins served in the military during the Vietnam era (1965-1975). Complete descriptions of registry development and characteristics of participants are given elsewhere.26-28 Of 10,253 eligible individuals, 8169 (80%) were successfully interviewed for the present study. The mean age of the sample was 42 years (SD, 2.8; range, 34-54 years); 94% of the men were non-Hispanic white and 6% were African American; less than 1% completed only elementary school, 33% completed only high school, and 39% graduated from college; 93% were employed full-time and 2% were employed part-time. Zygosity was determined by means of responses to questions about similarity of physical appearance supplemented with blood group typing information.29 Tests of the continuity model of PG were based on the 3372 complete twin pairs of known zygosity (1874 MZ pairs and 1498 DZ pairs). Bivariate model-fitting analyses were based on the 3372 complete twin pairs as well as 1125 individuals of known zygosity from incomplete twin pairs (516 MZ individuals and 609 DZ individuals). The presence of PG and AD was assessed by structured psychiatric telephone interviews. Interviews were conducted by means of a computer-assisted telephone interview version of the Diagnostic Interview Schedule for DSM-III-R8,30 disorders by trained lay interviewers who were monitored by a project director. Interviewers contacted twins and began interviewing after verbal informed consent was obtained, a method approved by the institutional review boards at the participating universities. Lifetime diagnoses of PG and AD were determined by standard Diagnostic Interview Schedule computer algorithms. Symptoms of DSM-III-R PG were assessed only among those individuals who had ever gambled, bet, bought a lottery ticket, or used a slot machine 25 or more times in a year. In addition to the DSM-III-R diagnosis of PG (DSM-III-R PG), we examined the association between AD and several other definitions of gambling-related problems. Individuals were diagnosed as having "subclinical PG" if they endorsed 1 to 3 lifetime symptoms of DSM-III-R PG. "Problem gambling" included both DSM-III-R PG and subclinical PG and was defined as having at least 1 symptom of PG. A 3-level "multiple-threshold" PG variable was also created by categorizing individuals with no DSM-III-R PG symptoms as a 0, with 1 to 3 DSM-III-R PG symptoms (subclinical PG) as a 1, and with 4 or more DSM-III-R PG symptoms (DSM-III-R PG) as a 2. The continuity model of PG implies that subclinical manifestations of PG (ie, 1, 2, or 3 PG symptoms endorsed) lie on the same liability dimension as the diagnosable DSM-III-R disorder (Figure 1, top). An alternative model, the discontinuity model, implies that the liability for subclinical manifestations of PG is distinct from the liability for diagnosable DSM-III-R PG disorder (Figure 1, bottom). The validity of the continuity model of PG was evaluated in 5 ways. First, we examined the risk of DSM-III-R PG among cotwins of men with subclinical PG compared with cotwins of men with DSM-III-R PG and no PG symptoms. Second, we examined patterns of within-individual comorbidity of AD with subclinical PG compared with DSM-III-R PG. Third, we examined the risk of AD among cotwins of men with subclinical PG compared with cotwins of men with DSM-III-R PG and no PG symptoms. All tests of significance were 2-tailed with an α level of .05. A fifth test of the continuity model of PG compared the results of bivariate model fitting of AD with 3 definitions of gambling-related problems (DSM-III-R PG, problem gambling, and multiple-threshold PG) to examine the similarity of the causes of PG liability and the comorbidity between PG and AD. Before model fitting, within-individual odds ratios and polychoric correlations between the 3 definitions of gambling-related problems and AD were computed. Confidence intervals (CIs) around odds ratios were computed with the use of 1000 bootstrapped samples from the original data set to adjust for the nonindependence of observations from twin pairs; polychoric correlations and their CIs were estimated with structural equation models that accounted for the twin structure of the data. In univariate model fitting of twin data, the variation in liability for a single trait is partitioned into that caused by additive genetic influences (A), shared environmental (C) or nonadditive genetic (D) influences, and nonshared environmental influences and measurement error (E). In bivariate model fitting, this is done for each of 2 traits; in addition, the correlation between the 2 traits is similarly decomposed into that portion resulting from additive genetic influences, shared environmental or nonadditive genetic influences, and nonshared environmental influences and measurement error that is correlated in the 2 traits (Figure 2). Models were fitted directly to the raw data by the method of maximum likelihood with the Mx program.36 The goodness-of-fits of a series of nested submodels were evaluated by comparing them with a saturated model that placed no constraints on the elements of the estimated MZ and DZ twin correlation matrixes. Selected as the final model was the simplest model that was consistent with the data (see Neale and Cardon,34 Heath et al,37 and Kendler38 for further details about model fitting). After selection of a final model, 95% CIs around parameter estimates were computed to evaluate the following hypotheses: (1) whether the genetic, shared environmental, nonadditive genetic, or nonshared environmental correlations between PG and AD (ie, paths rA, rC or rD, or rE from Figure 2) differed significantly from 0; and (2) whether the genetic or environmental correlations between PG and AD differed significantly from 1. Three sets of bivariate models were fit to evaluate the causes of comorbidity of DSM-III-R PG and AD, problem gambling and AD, and multiple-threshold PG and AD. Of the 6744 men from complete twin pairs, 94 (1.4%) met the criteria for a lifetime diagnosis of DSM-III-R PG, and 420 (6.2%) met the criteria for a lifetime diagnosis of subclinical PG. The risk of DSM-III-R PG was significantly elevated among the MZ cotwins (6.1%) and among the DZ cotwins (3.1%) of men with subclinical PG compared with cotwins of men with no PG symptoms (MZ: χ21=56.04, P<.001; DZ: χ21=5.83, P=.02; Table 1). The lifetime rate of AD was 35.2% among the 6744 individuals from complete twin pairs. Men with subclinical PG were at significantly elevated risk for AD compared with men with no PG symptoms (55.5% vs 33.4%; χ21=84.92, P<.001) and were not at significantly lower risk for AD than men with DSM-III-R PG disorder (55.5% vs 64.9%; χ21=2.78, P=.10). The risk of AD was also significantly elevated among both MZ and DZ cotwins of men with subclinical PG compared with MZ and DZ cotwins of men with no PG symptoms (MZ: 50.4% vs 33.5%, χ21=27.29, P<.001; DZ: 44.3% vs 35.0%, χ21=6.79, P=.009) and was not significantly lower than the risk of AD among the MZ and DZ cotwins of men with DSM-III-R PG disorder (MZ: 50.4% vs 52.8%, χ21=0.10, P=.75; DZ: 44.3% vs 43.9%, χ21=0.00, P=.97; Table 2). The risk for AD was elevated among the MZ and DZ cotwins of men with subclinical PG even when cotwins with a personal history of DSM-III-R PG or any PG symptoms were excluded (Table 2). The results of fitting the multifactorial threshold model to the twin data suggested that the assumption of a bivariate normal liability distribution underlying the 3 ordered PG categories could not be rejected by goodness-of-fit χ2 test for either MZ (χ23=3.4, P=.33) or DZ (χ23=2.4, P=.503) twins. Lifetime diagnoses of DSM-III-R PG (odds ratio, 4.0; 95% CI, 2.2-5.7; polychoric r=0.32; 95% CI, 0.24-0.40), problem gambling (odds ratio, 2.7; 95% CI, 2.3-3.2; polychoric r=0.31; 95% CI, 0.27-0.35), and multiple-threshold PG (polychoric r=0.31; 95% CI, 0.27-0.35) were all significantly associated with AD. Bivariate genetic and environmental models were fitted to examine the causes of this comorbidity between different definitions of gambling-related problems and AD and to examine the extent to which the genetic and environmental risk for PG overlaps with the risk for AD. The results of fitting various reduced submodels to the twin correlations (Table 3) suggested that for all 3 definitions of gambling-related problems, shared environmental influences and nonadditive genetic influences could be omitted without a significant decrement in model fit (Table 4). The final reduced models selected for the association between all 3 definitions of gambling-related problems and AD were the same (AE), and yielded similar estimates of genetic and environmental influences for PG and AD liability and for the correlation between the genetic and environmental liabilities for PG and AD (Table 5). The correlations between the genetic liabilities for PG and AD were significantly different from 0 for all 3 definitions of gambling-related problems. This suggests that there is at least 1 genetic locus that jointly increases the susceptibility for DSM-III-R PG and AD, for problem gambling and AD, and for multiple-threshold PG and AD. An alternative but less likely explanation is that there is a susceptibility locus for PG and another for AD that are statistically associated. Such an association could occur, for example, if these 2 loci were very close to each other on the same chromosome. The fact that the correlations between the genetic liabilities for all 3 definitions of gambling-related problems and AD were significantly different from 1 suggests that there are also genetic susceptibility loci that are specific for PG and AD. Overall, genetic factors accounted for 64% of the overlap between DSM-III-R PG and AD, 75% of the overlap between problem gambling and AD, and 74% of the overlap between multiple-threshold PG and AD. The correlations between the nonshared environmental liabilities for PG and AD were significantly different from 0 and significantly different from 1 for all 3 definitions of gambling-related problems. Thus, the hypotheses that PG and AD do not share any nonshared environmental risk factors and that the nonshared environmental liabilities for PG and AD are perfectly correlated were both ruled out for all 3 definitions of gambling-related problems. Overall, nonshared environmental factors accounted for much less of the overlap between PG and AD than did genetic factors. An examination of the proportion of genetic, nonshared environmental, and total variation in PG risk accounted for by the variation in AD risk (Table 6) suggests that AD risk accounts for a significant but relatively modest proportion of the variation in PG risk. In comparison with AD, relatively little is known about the causes of PG. To the extent that the causes of PG and AD overlap, knowledge about the causes of AD can be applied to understanding the causes of PG. The present investigation represents the first study to quantify the extent to which PG shares genetic and environmental risk factors with AD, by comparing the patterns of familial coaggregation of PG and AD in MZ vs DZ twin pairs. All previous studies that examined the familial coaggregation of PG and AD used the family history method,10,17-19,39,40 most used treatment-seeking samples,10,17-19,40 and most did not include an appropriate control group,10,17-19,40 making the interpretation of results difficult. In the present study, the familial coaggregation of PG and AD was examined by directly interviewing the relatives (ie, MZ and DZ cotwins) of individuals with PG to determine their personal history of AD. The results of the present study clearly demonstrated that the cotwins of men with DSM-III-R PG have elevated rates of AD compared with cotwins of men with no PG problems, and this was true even among twin siblings who did not have a personal history of PG. Although the differences in the rates of AD among the MZ vs DZ cotwins of men with DSM-III-R PG were not statistically significant, MZ cotwins had consistently higher rates of AD than DZ cotwins, which suggests a genetic cause of the familial coaggregation. More powerful model-fitting methods confirmed that the familial coaggregation of PG and AD was more likely caused by their having common genetic rather than family environmental risk factors. In a previous study of this twin cohort, Eisen et al25 found that 62% of the variation in risk for DSM-III-R PG could be explained by familial risk factors, but because of the relatively low prevalence of diagnosable DSM-III-R PG disorder in the sample, it was not possible to discern whether the familial aggregation of DSM-III-R PG was caused by genetic or family environmental effects. In the present study, the familial transmission of DSM-III-R PG was clarified when examined in the context of AD, a much more common disorder with a more clearly discernible mode of familial transmission. The pattern of cross-trait, cross-twin correlations between PG and AD was much more consistent with the familial aggregation of PG being caused by genetic rather than family environmental effects. The magnitude and sources of familial coaggregation between PG and AD were similar regardless of the definition of gambling-related problems examined, which suggests that AD and subclinical PG are correlated to the same extent and for the same reasons that AD and DSM-III-R PG are correlated. Additional tests of the continuity model of PG were all consistent with the hypothesis that subclinical PG and DSM-III-R PG have many, perhaps all, of the same risk factors in common. The results of this study suggest that subclinical PG (or problem gambling) mainly differs from DSM-III-R PG by requiring fewer, rather than different, risk factors for a given individual to be affected. These results are also consistent with the possibility that a minority of cases of DSM-III-R PG (too few to detect in our community-based sample) may be caused by factors distinct from those causing subclinical PG. The relationship between subclinical PG and DSM-III-R PG may be quite similar to the relationship between substance abuse and substance dependence, and therefore it may be warranted to consider for inclusion in the DSM a diagnosis for "gambling abuse" comparable with the diagnosis of substance abuse. Future studies of PG should also include individuals with subclinical levels of PG to better understand the full spectrum of this disorder. The finding of significant shared genetic vulnerability for PG and AD in this study might be accounted for by the greater sharing of etiologically relevant experiences by MZ twin pairs than by DZ twin pairs. To address this concern, we conducted a series of analyses in which we predicted twin concordance for PG and AD from several measures of shared childhood and adult experiences, controlling for zygosity. None of the measures of shared experiences predicted twin concordance for both PG and AD, suggesting that greater shared environmental experiences of MZ compared with DZ twin pairs is unlikely to have resulted in an overestimate of the genetic covariation between PG and AD. It is also possible that part of the association between PG and AD may result from a causal effect of PG on AD or of AD on PG. For example, many gambling facilities provide free alcohol to customers while they are gambling, and studies of individuals with PG confirm that engaging in gambling and alcohol use at the same time is common.41,42 Thus, it is likely that involvement in gambling may lead to heavier drinking or maintain or exacerbate existing alcohol-related problems. Conversely, AD may play a role in the initiation, maintenance, or exacerbation of PG. For example, several experimental studies have demonstrated that subjects will gamble more when under the influence of a moderate dose of alcohol than when given a placebo.43-45 In addition to a common genetic vulnerability for PG and AD, there may also be reciprocal causal effects between PG and AD, with PG increasing the likelihood of alcohol use and alcohol use increasing the likelihood of PG. Unfortunately, the men in our study were not asked about their ages of onset of gambling behavior and symptoms of PG, so it was not possible to rule out alternate causal interpretations of the association between PG and AD. The present study is limited in that it was based on middle-aged male veteran twin pairs who were assessed in 1992, before the recent surge in the availability of lottery, casino, and Internet gambling. Thus, the results may not be completely generalizable to other populations, such as women, adolescents, and certain minority groups, and different conclusions about the causes of comorbidity between PG and AD may have been reached if we had assessed PG more recently. Previous studies of this Vietnam Era Twin Registry cohort have examined the causes of comorbidity of AD with other addictive disorders, in particular, nicotine46 and marijuana47 dependence. A comparison of the results of the present study with these previous studies may be informative. Previous studies suggested that both nicotine and marijuana dependence share genetic risk factors with AD, with 46% of the genetic variation in the risk for nicotine dependence46 and 17% of the genetic variation in the risk for marijuana dependence47 being accounted for by genetic variation in common with the risk for AD. In the present study, we found that PG also shared genetic risk factors with AD, with 12% to 20% of the genetic variation in the risk for PG being accounted for by genetic variation in common with the risk for AD. Although the genetic association between PG and AD is not nearly as strong as the genetic association between AD and nicotine dependence, the strength of the genetic association between PG and AD is of similar magnitude as the genetic association between another addictive disorder, that is, marijuana dependence, and AD. It has been argued that addictive disorders are functionally equivalent,48 with the form of the addiction (eg, to alcohol, nicotine, marijuana, or gambling) being dictated more by environmental circumstances than individual genetic vulnerability. If true, this would explain the high rate of comorbidity among the addictive disorders, including PG and AD. The results of the present study, however, do not fully support this conclusion. Although PG and AD do share genetic vulnerability factors, there are additional factors that make an individual vulnerable to PG and not AD, and factors that make an individual vulnerable to AD and not PG. Perhaps the most unexpected finding of the present study is the extent to which the vulnerabilities for PG and AD are distinct. This is surprising because researchers have been much more successful at identifying risk factors common to the addictions and have had less success at identifying risk factors that are unique to a given addictive disorder.49 The results of the present study suggest that it is worth searching for risk factors that PG does not share with AD, as well as risk factors that PG does share with AD, to better understand the causes of PG. Accepted for publication March 7, 2000. This study was supported by grants DA04604, AA00264, AA10339, and AA11822 from the National Institutes of Health, Bethesda, Md; the Department of Veterans Affairs Health Services Research and Development Service (study 992), Washington, DC; and the Missouri Alcoholism Research Center at the University of Missouri–Columbia, Washington University (St Louis), and St Louis University (AA11998). We acknowledge the work of the following: (1) Midwest Center for Health Services and Policy Research: Vietnam Era Twin Registry, director, W. G. Henderson, PhD; epidemiologist, J. Goldberg, PhD; registry programmer, K. Bukowski; coordinators, M. E. Vitek, R. Havlicek; (2) Vietnam Era Twin Registry Advisory Committee: A. G. Bearn, MD (past), G. Chase, ScD (past), T. Colton, ScD, W. E. Nance, MD, PhD, R. S. Paffenbarger, Jr, MD, DrPH, M. M. Weissman, PhD, and R. R. Williams, MD; and (3) Department of Veterans Affairs chief research and development officer: John R. Feussner, MD; Department of Veterans Affairs Health Services Research and Development Service: director, John Damakis, MD; deputy director, S. Meehan, MBA, PhD. The following organizations provided invaluable support in the conduct of this study: Department of Defense, Washington, DC; National Personnel Records Center, National Archives and Records Administration, St Louis, Mo; the Internal Revenue Service, Washington; National Opinion Research Center, Chicago, Ill; National Research Council, National Academy of Sciences, Washington; and the Institute for Survey Research, Temple University, Philadelphia, Pa.
We also wish to thank Irene Fischer, MPH, Michael B. Miller, PhD, Jeff Scherrer, MA, and Hong Xian, PhD, for their technical assistance and Irving Gottesman, PhD, and Andrew Heath, DPhil, for their contributions to this project. Most importantly, we gratefully acknowledge the continued cooperation and participation of the members of the Vietnam Era Twin Registry. Without their contribution this research would not have been possible. Reprints: Wendy S. Slutske, PhD, Department of Psychology, University of Missouri, 210 McAlester Hall, Columbia, MO 65211 (e-mail: slutskew@missouri.edu).